Shipp adds non-LPR cameras, if installed properly still will work well in more controlled environments and run at a lower price point, which is a huge benefit. “Non-LPR cameras can offer end users lower cost, wider solution deployment and in many cases, greater acceptance from the management team who values acceptable results at an affordable cost,” Shipp shares. Chris Yigit, LPR senior product manager at Genetec, Montreal, also emphasizes that integrators should first consider the level of performance required for the application. “Many end users require a performant system to ensure success of their project. High capture rates (i.e., number of plates captured by the system prior to reading) and read rates are imperative in industries such as law enforcement (to catch perpetrators) and parking enforcement (to detect infractions). LPR cameras are designed with license plate reading and specific security and regional applications in mind. While non-LPR cameras are available at a lower price, the trade-off in selecting them can be lower performance and resulting lower capture and read rates. That being said, every application has different requirements and the selection of non-LPR cameras is possible,” Yigit says. 2 LightingOverall performance and capture rates are influenced greatly by lighting — an element that LPR and non-LPR cameras handle differently. “LPR and non-LPR cameras both can read license plates, but the non-LPR camera cannot read license plates in certain surroundings,” cautions Todd Pinnell, product manager, Video, Speco, Amityville, N.Y. This includes when the surrounding is very, very dark and a car is using its high beams. “The normal IR camera will fail to see the plate number in this situation. But the LPR camera will break through the strong lighting and see the plate number clearly,” Pinnell says. There are many cases when people using non-LPR cameras find there is not enough light to properly expose the plate, says Willem Ryan, senior product marketing manager, Bosch Security Systems Inc., Fairport, N.Y.
“Dedicated license plate capture cameras are designed specifically to overcome problems associated with glare from vehicle lights and/or sun, as well as those caused by the movement of the vehicle. They typically integrate infrared (IR) illumination and ambient light filtering technology to overcome lighting challenges, as well as fast shutter speeds — over 1,000 frames per second — for high-speed capture,” he describes. Ryan shares that Bosch’s new DINION capture 5000 camera illuminates the license plate with a burst of IR light while simultaneously filtering out visible light. This combination ensures well-lit plate images even in complete darkness and eliminates unwanted glare from vehicle lights. “The camera also uses an ultra-fast shutter and automatic mode switching to compensate for inconsistent ambient lighting conditions and minimize overexposed images,” Ryan adds. 3 Shutter SpeedLighting and shutter speed go hand in hand, both of which have traditionally been stronger in LPR cameras. Shutter speed really does make all the difference in the world when selecting cameras for LPR functions, Tompkins believes. “Any type of moving object like a vehicle, you need a fast shutter speed and more specifically a sensor on the camera that supports those fast shutter speeds. Newer network surveillance cameras have these additional capabilities,” he shares. Integrators need to check non-LPR cameras, though, because an automatic shutter speed will not cut it. “Integrators should note that the shutter speed of normal IR cameras is usually automatic (1/60-1/100000s), which will cause a trailing of an image during nighttime if the speed is over 6 mph. LPR cameras do not have this issue. For example, some cameras can read the plates of cars going over 100 mph,” Pinnell warns. Figueiredo also gives LPR cameras the advantage in shutter speed, as well as having IR built in to the camera. “Both are crucial because the infrared means that an LPR camera can capture license plate images day and night, and the very fast shutter speed means it can capture those images clearly no matter how fast the car is going. Non-LPR cameras can come equipped with fast shutter speeds, but it’s not a given and infrared is not necessarily typically a feature,” says Figueiredo. Integrators just need to verify that non-LPR cameras include the shutter speed and lighting they need, says Raul Calderon, senior vice president of operations, engineering and product management, Arecont Vision, Glendale, Calif.. When they do, the results can be great. “Megapixel cameras can provide high-resolution images using a high-speed shutter synchronized with an external strobe light for license plate recognition and intelligent transportation system applications. A sophisticated high-speed shutter in the camera can be calibrated to support a wide range of strobe lights, and the 1 millisecond speed shutter can be triggered by a network request or the input-output connector. The use of higher-megapixel resolution also enables a single camera to cover more than one lane of traffic when needed, which saves on system costs by requiring fewer components,” Calderon says. Read “One Camera, Two Lanes, 60 Percent Savings” on www.sdmmag.com. This Arecont Vision case study shows the powerful cost savings an increased field of view can have in an LPR application. 4 Field of View“Non-LPR cameras have a wider field of view and can see more things, like the car and the driver. The LPR camera can only see the license plate,” Pinnell says. Pat Fox, regional director of LPR and Law Enforcement Operations for New York-based SecureWatch 24, LLC (SW24), advises, “If you want larger field of view, and to see people — then the end user/integrator should be using non-LPR cameras,” he advises. LPR and non-LPR cameras will have differing fields of view to be considered. Tompkins at ipConfigure explains the difference between the two fields of view on the company’s embedded LPR (narrow field of view) and server-based LPR (wide field of view), and how camera resolution plays into it. “On server side we can have wide field of view because we can use high resolution cameras like 5 megapixels. The license plate only needs to be about 100 to 200 megapixels across, so at 5 megapixels, that license plate can occupy just a very small part of the image,” Tompkins describes. “On the embedded side, we have to use a much more narrowly cropped image, so we can’t have a wide field of view. That is because when we do embedded LPR processing we have to operate on a much smaller image — 640 by 480 — because of the limited processing that is available on the cameras. “So the embedded LPR is more of a traditional set-up where the camera is focused on a single lane and it is zoomed in to a degree. Back on the server side is where we can have a wide field of view and cover multiple lanes with a single camera,” he concludes. Because the larger field of view opens up the possibility to use fewer cameras, cost is reduced, which is always an element that catches end users’ attention. 5 CostCost is a powerful argument in favor of non-LPR cameras. Cost is hard to ignore in today’s market, and so is ROI. “Budgets are tight everywhere and grants are drying up, so while the prospects want the technology, they are concerned about affordability. That’s why it is important to show how LPR can be a revenue generator for the user and in a short time, the return on investment is such that it will pay for itself,” Fox says. The cost argument ramps up with the latest advancements to put the LPR directly on the camera. Earlier this year, ipConfigure announced what it called “the first commercially available embedded License Plate Recognition (LPR) application for IP cameras.” In partnership with Axis Communications using the AXIS Camera Application Platform (ACAP), ipConfigure’s embedded software is capable of autonomously and independently capturing, reading and recording license plates, all entirely within an Axis IP camera. For more information, search “Embedded LPR” on www.sdmmag.com. When LPR is completely contained within the camera, there is a drastic reduction in cost, Tompkins relates. “Realistically you could have a complete system with the camera, software, and lens that is extremely competitive compared to any server-side solution. With a server-side solution, you have cameras, software, a server — which has to run on network — maintenance costs for that server and network, plus an IT staff and more. “In contrast, embedded LPR works like an appliance. Just the camera is all you need. It is simpler, but its gets the job done. Embedded LPR is still perfectly suitable where cars are moving slow like parking lots, checkpoints or guard houses. On roads where traffic is faster you look at a different solution,” he says. Figueiredo also points out that there are many different non-LPR cameras at many different prices to choose from, which is not the case with LPR cameras. “Non-LPR cameras run an incredible range, from analog to IP, and various sorts of resolutions all the way up to megapixel. They also address a very wide range of needs that cover the range of video surveillance concerns,” Figueiredo says. The more the installation can do, the better. “Using a decent quality network camera with an embedded LPR analytic will generally be less expensive and offer more widespread features than the traditional LPR camera, which means it will open the door for unique LPR applications for non-traditional users,” says Steve Surfaro, Axis Communications’ business development manager and security industry liaison. “Integrators need to first educate practitioners to understand that, depending on their needs and vehicle speeds, they can now benefit from license plate recognition intelligence without having to invest in specialized LPR cameras. 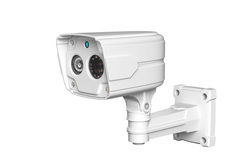 Network cameras will provide much more versatility, including higher image detail and additional surveillance applications, while the embedded LPR analytic enables visitor management, contractor tracking, alerting security to white- and black-listed vehicles, parking garage management and so on. This will help customer operations run lean and much more efficiently, all while gathering invaluable data,” Surfaro describes. However, when the quality of the data matters foremost, LPR cameras still rise to the top, Yigit states. “LPR cameras are specialized devices that are specifically designed to read license plates with great accuracy in all conditions and across all different types of plates. Non-LPR cameras are available at a lower price but the trade-off in selecting them can be lower performance and resulting lower capture and read rates. Shipp agrees. “Customer satisfaction and meeting contractual performance issues can favor selecting a LPR camera custom-built for the application.” He explains that field experience and learning curves have enabled LPR manufacturers to better understand the environmental and operational realities of their customers, resulting in an improved product at a competitive price. While LPR camera manufacturers and non-LPR cameras manufacturers will agree to disagree on which type of camera is better, they will agree on one common fact: more is possible with license plate recognition than ever before. Developing Opportunities License plate recognition (LPR) can do more today, offering new opportunities. SDM asked about unique applications that seem to be picking up traction for using LPR-type software/cameras. “For the law enforcement community and municipalities, we are seeing impressive interest in using mobile LPR to generate parking tickets and violations directly from a police car or municipal vehicle merely by driving up a street and looking for ticket scoff-laws or overtime parking violators — and of course, stolen vehicles. This has tremendous potential for our industry. Finally, we have a technology that can show a hard-core return on investment to the end-user. LPR will be a big-time revenue-generation source for cities and towns. The days of physically chalking tires of parked cars are over. It can all be done electronically today.” — Jay Stuck, vice president of sales and chief marketing officer, SW24, New York.